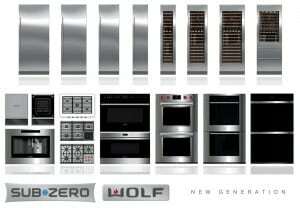 Sub-Zero manufactures some of the finest commercial kitchen appliances on the market. With outstanding features such as dual refrigeration and extensive quality assurance testing, handmade by experienced professionals, it’s hard not to consider purchasing a Sub-Zero refrigerator, or wine storage units for your kitchen. Kitchen appliances are often taken for granted as everyday necessities, but it is important to remember that they are investments as well. When you invest in a commercial grade appliance, you will be getting the best value and performance available. However, it is an unpleasant truth that commercial appliances of all kinds, even those that carry the high standards of Sub-Zero manufactured products, will suffer from malfunctions and breakdowns. All of the sudden, you might find that your state of the art unit has turned from a reliable, everyday convenience into a major headache that needs to be dealt with as soon as possible. Oftentimes, reading the owner’s manual or searching online for a quick fix will only get you so far, and you will require expert assistance in commercial appliance repair. If you are a Sub-Zero kitchen appliance owner in the Dallas-Fort Worth metroplex area, contact C&W Appliance Service for all of your urgent Sub-Zero appliance repair needs. C&W Appliance Service technicians specialize in Sub-Zero appliance repair and service on all Sub-Zero models, as well as many other major brands and types of appliances. The next time your Sub-Zero refrigerator, freezer or other appliance needs a helping hand, consider C&W Appliance Service for our Sub-Zero expertise and excellent customer service.